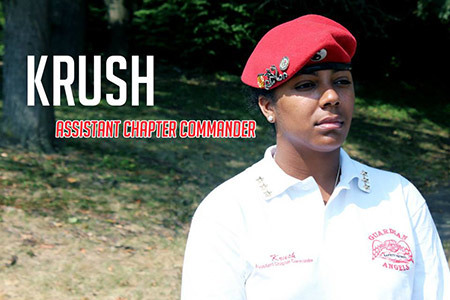 Victoria joined the Guardian Angels and Krush Kent was born, she came to the team by way of an organization she formed called Remember Me which was an organization she established in April of 2011. The goal was that once a month “Remember Me” would not only spread awareness on the crimes & disappearances that took the lives of these victims but she could also profile the stories, the names, the faces and also the story of how they lived. Krush wanted to show how the loss of these individuals has gravely affected the families and friends of these victims. As a guardian angel “Krush Kent” has elevated not only the amount of activities but more importantly increased the commitment of involvement with manpower, effort, innovation and a closer more personal touch of attention to the families and communities they serve. As second in command with her innovation and dedication to the Guardian Angels this group is sure to remain at the top of their game in helping to lead the way in community service empowerment. Krush Kent is a Baltimore City resident, a Graduate of St. Timothy’s High School and has a BA from Loyola University in English with a minor in Spanish and is employed by the state and works in Annapolis MD.